Our beautiful memorial guest books sell themselves! How would you like to add some profits to your current business or maybe even have additional income with a part-time business? We are now introducing a wholesale program for our popular and unique memorial guest books! 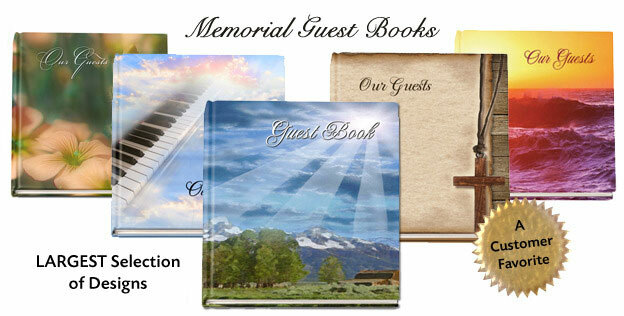 There is NO other company that manufacturers these books online because The Funeral Program Site are the creators of this look and designed our exclusive line of memorial guest books! Our wholesale program allows you to purchase our memorial guest books at wholesale costs and permitting you to sell them at retail costs, therefore creating a profit for you. Signing up is easy! You will need to meet the requirements noted below in order to join our list of wholesale partners. You cannot be a competing template site. Some exceptions may apply, please inquire. A minimum purchase of $250 is required for the initial order. All subsequent orders minimum is $150. The minimum retail price must be equivalent or above the retail cost sold on this website. The guest books cannot be modified or added to in any way. The wholesale program application must be fillled out upon interest. There is a 2 week processing time for all applications to be reviewed for approval. Select from over 300 Designs! A memorial guest book is a must at all funeral or memorial service ceremonies because it helps the bereaved family keep track of who attended the service. This book is a family favorite and is treasured long after the service has ended. It is attractive enough to sit on a bookshelf or on a coffee table for a cherished keepsake. It doubles as a guest registry book and scrapbook, if desired.